Leading London UK based automation specialists Kinesys has sold the first variable speed motion control system into Israel, to Jerusalem and Tel Aviv based Stage Design, one of the country's leading rental and staging companies. The sale consists of a 24 way Kinesys Elevation 1+ variable speed motor control system, with 16 x Liftket 500kg 20m/min hoists and 8 x 2 tonne Yale motorised Beam Trolleys (plus 8 x ‘slave’ beam trolleys) – all converted for use with Kinesys Elevation 1+ variable speed controllers. For control, the Stage Design team chose the latest Kinesys K2 3D graphical automation and motion control software. Stage Design is part of The Design Group, whose Eyal Lavee explained that they had been checking out the options on the automation front for some 2 years before the purchase, "The Israeli market is always keen on new effects," he confirms. After careful deliberation, they decided on Kinesys as the best choice for their touring and general production needs. "It's excellent quality and engineering, flexible, durable and straightforward to install. The innovative programming possibilities of the K2 then really made the final choice an easy one," confirms Lavee. As soon as it arrived in Israel, it went straight out on the Festigal 2010 Show, a famous annual children's extravaganza in Hanukkah which has been going for 30 years and is one of the largest and most popular in Israel. It tours between 3 venues in Haifa, Tel-Aviv and Jerusalem over the period of a month, producing about 100 shows that are enjoyed by over 500,000 people. 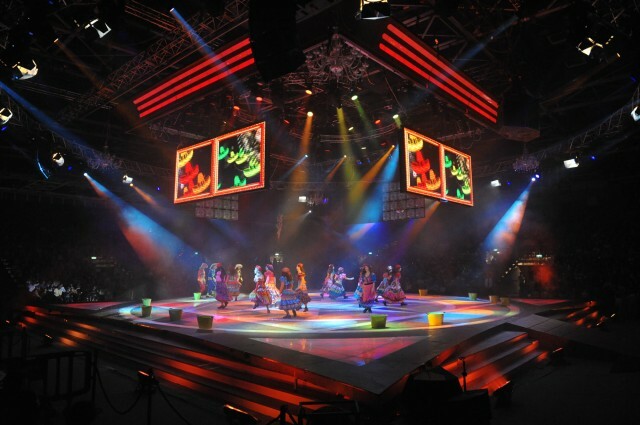 Festigal is an in-the-round arena stage set up, based on lively audience interaction and 8 LED screens flown around a 15 metre revolving stage. The Kinesys system enabled the screens to make a series of synchronised moves – both vertically and horizontally – throughout the show. They could also all be moved together to work as one single surface, or they could be split into 8 individual sections. Over 150 different positions were programmed into the K2 for the show, which was operated by Tsah Eliahoo. The LED screens were flown on special lightweight aluminium I Beams with 'smart' connections to any truss, a custom developed and manufactured product from Stage Design. This maximises headroom and speeds up installation time. Kinesys' Sales and Business Development Manager, Mark de Gruyter, along with training and technical support specialist, Andy Hicks, travelled to Israel to co-ordinate the initial training with the Stage Design crew – as the equipment was going into immediate use. "I could not wish for better support from Kinesys for that first set up," comments Tsah Eliahoo who is also head of the Kinesys team for The Design Group. de Gruyter and Hicks worked with Tsah and his team for 7 high pressure days of programming as the show was in production rehearsals. This resulted in Eliahoo gaining, "A very full understanding very quickly about the system's capabilities". Eyal Lavee adds, "Kinesys founder & Managing Director, Dave Weatherhead, proved to be a true partner. When some additional training was needed, he jumped on a plane and came out with exactly the right backup we needed at the time – very impressive". Everyone is happy with the results. "Within the Design Group we have huge faith in this system, and believe that creative minds will find many ways to integrate Kinesys into all types of designs for events, tours, exhibitions, theatrical shows and TV productions, etc," concludes Lavee. A more detailed look at this show, along with pictures and video of the show can be found on our Projects page.